What is multitasking? It refers to the computer being able to rotate quickly between various jobs, appearing to be doing them all at once. It goes beyond just having two or more loaded at once, as this by itself might still require the user to put one on hold while (s)he works in another. The 6502.org forum topic "Multi tasking?" has many good considerations regarding multitasking on a 6502, and links for more help, including to additional forum topics and other resources on the web. Do read through that topic (which is in its fourth page now). Rather than repeating that material here, I want to cover three simple methods I've used (sometimes in combination) that have effectively prevented the need for a multitasking OS of any kind, in my applications. In preemptive multitasking, the OS tells each task not only when to run, but also when to stop, on a strict schedule. Think, "dictatorship." Interrupts tell when to run a routine, based on an event, for example data having arrived at a communications port, or even a timer that is saying that something has to happen every so often, regardless of other things going on. Think, "urgency." Alarms have a lot in common with timer interrupts, but the number of alarms that can be pending at once is practically unlimited, and the time between them tends to be much longer. Think, "day planner." A cyclic executive is just an endless loop of calls to the various tasks as subroutines, a type of coöperative multitasking. Tasks take their turns and do the next thing they need to, giving back control as soon as practical, in the interest of getting through the list of tasks quickly and keeping other tasks from waiting. Think, "cooperation." Often what is thought of when we mention multitasking is preemptive multitasking operating systems. "Preemptive" means there's a timer that produces an interrupt for the OS to preempt, or take control away from, the currently running task, and get another task going wherever it left off last. It basically says to the currently running task, "I don't care what you're doing, or how heavily involved you are in it, you're done!" No Mr. Nice Guy. No "Find a good stopping point and report back as soon as is practical." The OS takes up the job then of saving the things the task will need for its continued execution the next time it is given a chance. Preemptive multitasking presents a lot of overhead though, and often forbids interrupts for extended periods during task switching. In many cases, it forbids tasks to directly access hardware resources, requiring going through OS calls instead, again producing delays that are unacceptable for some applications. For these reasons, preemptive multitasking is not usually suitable for hard realtime applications where missing deadlines means a failure, either because the hardware that the computer is controlling won't work right (or at all), or fast signals that you're trying to produce or record won't be handled on the correct timing, or in some cases (not mine), where missing these deadlines could mean damage to equipment, or even serious injury or death. My earliest work example of a realtime design was a high-end intercom for private aircraft in 1993 whose separate user control module depended on pulse lengths generated by software in the 65c02 computer, which were governed by interrupts from its 65c22's Timer 1. If something were to delay the timer interrupts, this control head would not work. In a crude but valid way, due to the interrupts, the system could be considered at least dual-tasking; the task of feeding the control module the needed signals and watching the info it sends back, and the "everything else" task which babysat a lot of intercom functions in a loop, functions whose timings weren't as critical. Actually, this main loop did call the various functions as subroutines (or more or less as tasks), but my code organization was still poor back then, and looking at my code for it now, I do not find it intuitive to figure out what each one should do under various conditions each time it runs. In a minute I'll address separating the tasks and making them like state machines, more structured, more clear, and easier to debug and maintain, without using a multitasking OS. Unlike a PC, my workbench computer exists not for human interface, but for controlling things on the workbench, taking data, etc.. Its whole raison d'être centers around having very immediate access to the hardware; so it would be unacceptable in this situation to have an OS that requires that programs go through OS calls to gain access to the hardware. Access could be through a single sub-microsecond instruction to write to a port for example. I have not had to deal with problems like mutual exclusion, because so far, in my embedded systems, I have not had situations where different tasks wanted access to the same resources at the same time, nor mass-storage file systems, although I can imagine contentions on 65SIB devices; e.g., that one rather high-priority device may cause an interrupt while another device is getting fed a stream of bytes that cannot be interrupted unless you start over when you come back to it. If this keeps happening, the transfer would never get completed! The bus spec does have a provision to put a device on hold without de-selecting, but I have not gone that far with it myself. These multitasking methods require tasks to be of the RTC type. "RTC" in this case stands for "run to completion," not "real-time clock" (although a real-time clock will usually be involved too, so the terms will mostly be spelled out instead of abbreviated). This is because a task's program pointer and anything it might have on a stack is not preserved from one run of the task to the next run of the same task. Obviously then, the task has to finish up with the stack before giving up control, and leave it as it found it; and, if it matters what part of the task the computer jumps into the next time the task runs, the task will have to keep a record of that for itself, because there's no OS there to do that job for it. It is generally simpler and more efficient if the task can do this for itself anyway. Particularly in the cyclic executive, "run to completion" does not mean the entire task runs, or that it has nothing left to do when it returns, but rather that it runs until it finishes what it needs to do at the moment, and it returns when it reaches a good stopping point. This eases the job of switching tasks and picking up where it left off again the next time it runs. As we'll see in a minute, usually only a small portion of a task's entire code will run each time the task is called; but it will be the correct portion for the current situation. I have a primer on 6502 interrupts here on this site (and it's also on 6502.org) (enjoy my out-of-date cartoons! :D ) and another on servicing interrupts in high-level Forth on a 65c02, with zero overhead, here on this site (and it's also on 6502.org, so I won't repeat that material here. The purpose of the interrupt is of course to let the main program(s) run freely and efficiently, not having to keep checking to see if a super-urgent need has arisen, yet be able to service that need immediately when it does arise— with much better response time than it could if it kept checking for it. Servicing ports on demand or doing another program portion on a schedule dictated by a hardware timer are examples of how the computer can appear to be doing more than one thing at a time. The 6502 has outstanding interrupt performance. Take advantage. There's plenty on these things in the interrupts primer; but here I want to put further attention on using interrupts for a real-time clock which will be used in the cyclic executive method further down. I've been using a VIA's (6522's) T1 timer for a software real-time clock. It interrupts every ten milliseconds to increment the timer bytes as shown in the code in the article. This real-time clock is a necessary component for many tasks, and a one-second (or even one-tenth-second) resolution that you might find on some hardware real-time-clock products is definitely not adequate in this case. Many applications have no need for time-of-day or date functions, but there's still the need to time key debouncing, beeps, looking for time-outs on other interfaced equipment, and other things that need to be timed. Software timing loops for delays are not acceptable because the computer has far too much to do to be stopping and twiddling its thumbs for the duration of the delay— and that's especially true when it must time several things at once. This will get more attention in the "Cyclic executive" section further down. The 6502 interrupts primer has lots more on interrupts, including example code and circuit info. Also, as a follow-on to that, BDD has a 65816 interrupts article, at http://sbc.bcstechnology.net/65c816interrupts.html, also found on 6502.org at http://6502.org/tutorials/65c816interrupts.html. Toward the end, he goes into things relating to preemptive multitasking OSs and implementing an execution environment that prevents user programs from affecting each other or an OS kernel, with the development of a protected environment not unlike that of a commercial multiuser system. Although he does not delve into OS design, he does discuss the basics of using the kernel trap software engineering technique to implement an OS application programming interface (API) on a 65816 system. An alarm is run like an interrupt, again a run-to-completion routine, triggered by the real-time clock seeing that the time now matches the alarm time, and starting execution of the routine at the address associated with the alarm. My inspiration for alarms came from the time functions on my HP-41cx calculator/computer which allows various kinds of alarms. These days, its alarm functions get used for little besides getting me up in the morning with its beeps; but you can also have it execute a program when the alarm comes due. 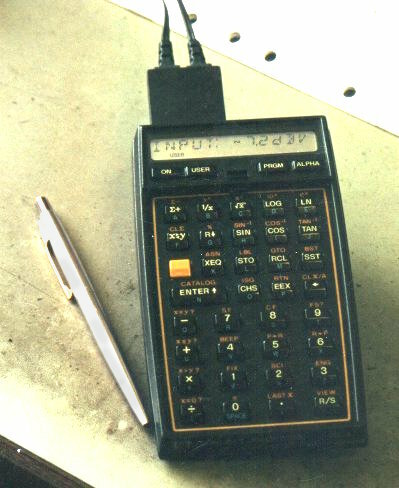 The calculator's timer hardware can even wake the calculator up when an alarm comes due, start running the program specified by the alarm, which can do countless control functions and take data from lots of instruments on the workbench, log it, print it, etc., and even put itself back to sleep when done. The coming-due of an alarm can also interrupt the running of another program, acting as an interrupt. Many pending alarms can be held in a queue at once. The alarms are sorted by chronological order, so the RTC ISR only has to watch for the first one in line. There is no need to check all the pending alarms for a match. When checking for a match, the very first byte (the low byte) will usually fail the test, so you jump out of the routine quickly without wasting much time. Your alarm-management software can of course keep, install, delete, and sort (by due times) many alarms, and any given alarm's routine might also set an alarm for the next time it's supposed to run. It might be to collect new data every second, every minute, every fifteen minutes, or whatever. I'm using a 10ms resolution, meaning I could conceivably have as many as 100 alarms per second and schedule something up to 2^32 centiseconds (over 16 months) out. I don't think I've ever scheduled any that fire really fast, but one recent application on the workbench was to test battery life on a new product, taking battery voltages, and, every 15 minutes, printing out the accumulated run time, the current battery voltage, the lowest battery voltage seen over the last 15 minutes (because the load is not consistent), how fast the low-battery LED was flashing (since it is designed to flash faster and faster as the batteries weaken), and whether the product had shut itself down yet because the voltage was too low. Then I was able to use the workbench computer for something else at the same time, with my other program not having to know it wasn't the only one running. I was experimenting with something else and developing code for that, and every fifteen minutes, the printer pounded out another line of battery data. 20+ years earlier, I did a similar thing with the calculator shown above, having it connected to a data-acquisition unit and a printer. Have the real-time clock ISR check for more possibly due alarms after executing the first one. Have the real-time clock ISR watch for the next alarm being past due, rather than limiting it to an exact match. For less runtime overhead, it might be better to have the alarm installation routine see if there's already an alarm with the same due time, and if so, increment the next one by a tick (or even more if there's any risk that a single tick won't give the last previous alarm time to finish executing first). INCR10ms: PHA                   ; get executed. Save A since we'll use it below. LDA  VIA1T1CL         ; Clear VIA1 interrupt. INC  cs_32            ; Increment the 4-byte variable cs_32. BNE  INC_TOD          ; If low byte didn't roll over, skip the rest. INC  cs_32+1          ; Else increment the next byte. BNE  INC_TOD          ; If that one didn't roll over, skip the rest. ; the centiseconds bytes, not the time-of-day and calendar bytes. BEQ  CkAlmEnd         ; byte of the addr of its routine, then just exit. BNE  CkAlmEnd         ; the case), then just exit. LDA  cs_32     + 3    ; and finally the high byte. ;------------------            ; registers (ending with A), and does RTI. If there's no alarm pending, the RTC NMI ISR will usually take 8 instructions, including the RTI. If there is at least one alarm pending, it will usually take three more instructions. Comparison is done on the low byte first and high byte last to save cycles, since the high bytes are more likely to be the same. Where my setup goes over 16 months, if my alarms are typically for the same day, the high byte will usually match, requiring more byte comparisons in order to see that we're not there yet; so that's not the place to start the comparison. ; cs-32-matching time and 2 for the alarm-execute address. ; ALM_cs_32 and ALM_XEQ_ADR are for the first one in line. do conversions from HH:MM:SS to centiseconds (or milliseconds, or whatever you use) and back. How complex you want to get is up to you of course. These are merely suggestions, based on what I have running in Forth. Certain things in your tasks may be inappropriate to time with alarms though. Take for example a key-scanning routine. Debouncing is always needed, and often done poorly. After the routine sees that you've pressed a key, it needs to wait to see if it finds it pressed for 50ms in a row before submitting it to the other routines as a valid keypress. Do not set an alarm for 50ms later. The task needs to be run many times in that amount of time, making sure the key remains pressed for 50ms in a row, and it should re-start the count every time it sees the key up and then down again. This constant re-checking does not need to be on any particular schedule though. There's little difference between getting to it every 100 microseconds versus every 2 milliseconds, while taking care of other tasks in between these checks. That's one of countless scenarios that are better done with the cyclic executive method below. Since Jan 2013, I've done a couple of multitasking projects with PIC16 microcontrollers which don't have the resources for a multitasking OS. I'll call them "project A" and "project B" below. (They were for work and I can't divulge much that would give away the application.) A cyclic executive is just an endless loop (I always call it MAIN_LOOP) of subroutine calls. I had used a cyclic-executive idea many times before; but this time I went further with the state machines for the various tasks to know what part they should run next. "State machine" basically just means the task uses a variable to keep track of what part of the routine to route execution to the next time the task is called from MAIN_LOOP. The state number is held in the variable, and depends on what the task was doing last, and may get changed ("transitioned" to another state) when it has finished something, or when an event or clock time that it was watching for arrives, dictating that we're moving on to the next step, or perhaps to start over. The beginning state is 0. The state may remain unchanged for long periods while the task is waiting for something; and in that case, the same little part of the task code keeps getting run every time the task is called. As long as it sees that the awaited event or time has not arrived yet, it just exits without doing anything. When the event or time finally does arrive, the task takes the appropriate action, and transitions to another state. A transition often consists of incrementing the state to the next higher number; but there are a lot of exceptions where it may get changed to something else. Check to see if it's even supposed to be active at the moment. If the answer was no, it would exit right away, having taken very few instructions' time. What to do next may depend on the state it left off in, the last time it ran. I usually use a CASE statement (called "SELECT CASE" in BASIC and "switch" in C, but I named many of my structure macros after Forth structures) to steer the execution to the right part of the routine depending on the state. (Task states' variables are initialized to 0 in the reset routine.) Alternatively, a jump table may be more appropriate in some situations. For the current state, was it waiting for something? Perhaps arrival at a time on the clock, or for a particular event to happen? Has it happened yet? If not, just exit, again without having taken much time. If the awaited time or event did happen, do whatever the event requires, and transition to another state, by changing the appropriate variable, for example KEY_STATE. Which state it transitions to may depend on what just happened; i.e., it is not necessarily just incremented. There may be variations, depending on your application. Many tasks will have little or nothing to do most of the times they're called, so they take very little time. Some tasks won't be activated at all for long periods of time, so they exit immediately. Such a task might first test a flag variable to see if it's even supposed to be active at the moment, and if not, return immediately. The entire time it takes then is only the JSR<task>, BIT<variable>, BMI, RTS, only 18 clocks, including the JSR and RTS. 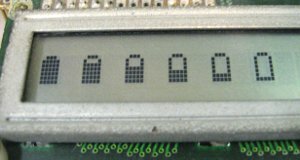 For an example of a task that watches for a time on the clock, consider a task whose job it is to put a battery icon in the lower-right corner of a 2x16 intelligent character LCD, with the battery state being shown by how full the icon is, and when the battery gets below a certain level, make the icon blink with a one-second cycle, regardless of other tasks running. (I've done a similar thing with an LED where the first indication comes when there's one-third of the battery life left, and the blink rate increases as the battery voltage continues to drop, giving a pretty good idea of how much life is left. We'll avoid that complexity for this example though.) These LCDs, available from many manufacturers, all use the same instruction set (and have for about 30 years— how's that for stability! ), and they allow making your own custom characters in a 5x7 dot matrix. A custom character of a battery works out nicely. (I have 6502 sample LCD code here.) We will take a battery voltage measurement twice per second, matching the rate the icon turns off and on if it's supposed to blink. CLR_FLAG  BATT_DISP_FLAG         ; and record that the battery display is off now. SET_FLAG  BATT_DISP_FLAG         ; space); so just record that we're blinking it back on. END_IF                                  ; pseudo-ASCII (custom character). <save cursor position (whether visible or not)>    ; the right charge level) or a space. On the left, the Icons are five dots wide, and on the right, four. I also tried three but it turned out looking more like a baby bottle. (Pardon the corroded bezel. The LCD is 27 years old!) If your application doesn't need more than eight custom characters, you could probably define them all in the reset routine and leave them alone after that. 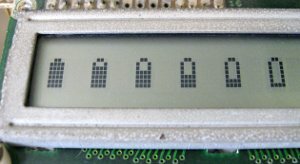 The Forth code that I used for the pictures above is at the end of the sample LCD driver code, at http://wilsonminesco.com/6502primer/LCDcode.asm. It's the only part of the file that I don't also have in 6502 assembly. It just took a few minutes to write, an instant to compile on the workbench computer in spite of an unrelated application loaded that was still in use, and it worked on first try— which is partly why I use Forth a lot. Regarding the target time variable which might be called BATT_DISP_TM for example: Although 8 bits may be enough to make the blink rate appear steady, a cyclic-executive multitasking application of this type will probably have you using 16-bit routines for doing transfers and calculations of times for other routines, even if the RTC uses more. (You can select which bytes of the RTC to use, e.g., bytes 0 and 1, 1 and 2, or 2 and 3.) The target value should be initialized in the reset routine to prevent super long delays before the first blink, if the icon ought to blink. Now let's look at a couple of examples of using a state variable for the task to know what to do each time it is called, rather than just going from beginning to end. We have another device sending two-byte readings from a sensor, at unpredictable intervals, and we bring them in on a 6551 ACIA, with no handshaking, to be used by another task when needed. At any given time, the other task will use the last full reading available. The second (low) byte could be anything, but the first (high) byte will never have its high bit set; so to prevent synchronization loss, the sending device puts two or more bytes of value $FF between frames. Although this receiving job could be handled in an ISR, this time we want maximum interrupt performance for something else, and there's nothing very performance-critical in the non-ISR work, so we can make this a task (we'll name it WATCH_ACIA), and call it from MAIN_LOOP. The 6551 ACIA is set up and will set bit 3 in its status register (ACIA_STAT_REG) when a byte comes in, but we disable the receiver interrupt (by setting bit 1 of the command register) so a byte received won't pull the IRQ line down. The speed is slow enough that there's no danger of overrun. So below is example code. Structure macro definitions are in the source code file in the structure-macro section of this website. Other macros' meanings will be clear from the names anyway. ; When RX_STATE = 0, an $FF byte will be required to increment RX_STATE to 1. Other bytes do nothing. The $FF is discarded. ; When RX_STATE = 1, only a non-$FF byte will be put in READING_BUF and increment RX_STATE to 2. More leading $FF's do nothing. ;                                                                                                               be returned to 0. CASE_OF  0                             ; In the case of RX_STATE being 0, an $FF is required to increment it to 1. INC  RX_STATE              ; move on to watch for a valid (non-$FF) first byte. END_IF                         ; The accumulator value gets discarded. END_IF                             ; If no byte came in, just exit. CASE_OF  1                             ; To get here, we've received the $FF marker and we're looking for a valid 1st byte. INC  RX_STATE              ; and move on to watch for the 2nd byte which could be anything. END_IF                         ; If it's not a valid high byte, just discard it, and leave RX_STATE as is. CASE_OF  2                                  ; and we're waiting for the second byte which could be anything. STZ   RX_STATE                      ; in the two-byte READING value), and go back to state 0. END_IF                                  ; If no byte came in, just exit. STZ   RX_STATE                         ; If there's any chance for state to go invalid, just reset it and start over. <subtract the target time TX_TM>    ; resulting in long delays when the next byte is available to send. RTS_IF_MINUS                        ; Just exit if it's not time yet. END_IF                                  ; code next time. RTS_IF_FLAG_VAR  TX_FLAG,  IS_CLEAR     ; If there's nothing to transmit right now, just exit. CLR_FLAG  TX_FLAG                       ; and it's safe. Indicate that we're taking the byte. STA  ACIA_DATA_REG                      ; and send it. INC  TX_STATE                           ; Record that the next time through is to monitor the delay. ; Transfer time from the clock to 2-byte ACCb. BEGIN                           ; could watch for low byte not changing too, but that'd require a second loop more often. COPY  TIMER+2, TO, ACCbHI   ; Store the high byte first. CMP   ACCbHI                ; see if the high byte has changed. UNTIL_EQ                        ; If it has, loop again to repeat the process. RTS                             ; Otherwise you have a reliable output. ; 0 = Waiting for key press. Key press increments state to 1.
;      Getting through the debounce period increments the state to 2 for repeating keys, 3 for non-repeating. ;      Shift key toggles shift status. Other keys turn off shift status when they're released, whether repeating or not. ;      When state 1 increments KEY_STATE to 2, it sets the repeat time to 3/4 second from now. ;      When state 2 actually reaches a repeat, it sets the repeat time to 1/4 second from now. KEY_STATE is not incremented. ;      Since the shift key cannot repeat, any key release from state 2 turns off the shift. ; 3 = We get here from state 1 if it's a non-repeating key. After the debounce period was over, state 1 registered the key. ;      different key, then shift has done its job so state 3 clears the shift status before going back to state 0.
; Four-byte variable TIMER gets incremented by the ISR, from interrupts from a VIA T1 (or similar hardware timer). ; the second key. To undo shift without pressing another key, press <shift> again. ; Keybeep and type-ahead would be easy too, but I was short on program memory and they were not needed for the project. KEY_COL_DET:            ; Used by WHICH_KEY below which selects a row to pull up. <do stuff>      ; Subroutine KEY_COL_DET looks at columns in order. WHICH_KEY:              ; Subroutine called by KEY_TASK. At the end, output is in NEW_KEY_SCAN. <do stuff>      ; It does not affect NEW_KEY_FLAG. KEY_TASK sets that if appropriate. p?TERMINAL:             ; Subroutine like ?TERMINAL in Forth but for keyPad. <do stuff>      ; At the end, Z clear means a key is pressed. KEY_TASK:                                       ; When there's a new key, its raw value is put in NEW_KEY, and NEW_KEY_FLAG is set. RTS_IF_ZERO                     ; and none is pressed yet, just exit. JSR   WHICH_KEY                 ; If a key _is_ pressed, see which one, and put it in NEW_KEY_SCAN, used below. END_OF                              ; and exit (below, at END_CASE). ; pressed, then we find out which one. WHICH_KEY's output is in NEW_KEY_SCAN. CMP     KEY                     ; then see if same key still being pressed, with no 2nd one at the same time. STZ  KEY_STATE              ; col 1 row 4 is key #13, regardless of whether shift was pressed or not. XFER_TO_ACCa  KEY_TM            ; minus KEY_TM (which was calculated earlier in state 0). JSR  DBL_SUBTRACT               ; b=b-a. a remains unaffected. "b" and "a" are 2-byte virtual ACCumulator regs. RTS_IF_MINUS                    ; If it's negative, we're not done with the debounce period yet, so just exit. LDA  KEY                        ; Here we've reached the end of the debounce period with the key still pressed. CMP  #RAW_SHIFT_KEY             ; See if it was the shift key. PUT  3, IN, KEY_STATE       ; except by the separate task that turns the shift-key annunciator LED on and off. ELSE_                                     ; Otherwise, present the new key to the outside world. STA  NEW_KEY                          ; and put the result in NEW_KEY. SET_FLAG  NEW_KEY_FLAG                ; Regardless, set variable NEW_KEY_FLAG to alert any receiving routine. XFER_ACCb_TO  KEY_TM            ; and store it (2 bytes) so we don't have to keep calculating it. INC   KEY_STATE                 ; Go to the next state for repeating. CASE_OF_  2                         ; Debounced key has been recognized and recorded. Is it time to repeat? LDA  NEW_KEY_SCAN               ; See if it is still being pressed. CMP  KEY                        ; Is the same one being pressed, without any others? XFER_TO_ACCa  KEY_TM            ; minus KEY_TM (which was calculated earlier in state 1). JSR  DBL_SUBTRACT               ; b=b-a. a remains unaffected. "a" and "b" are 2-byte virtual ACCumulators. RTS_IF_MINUS                    ; If it's negative, we haven't reached the repeat time yet, so just exit. STA  NEW_KEY                          ; and put the result in variable NEW_KEY. SET_FLAG  NEW_KEY_FLAG                ; Regardless, set NEW_KEY_FLAG for handshaking with the receiving routine. JSR   XFER_TM_2_ACCb            ; Transfer the current time to 2-byte virtual ACCcumulator b.
XFER_ACCb_TO  KEY_TM            ; and store it so we don't have to keep calculating it. KEY_TM is 2 bytes also. END_OF                              ; Do not change KEY_STATE. CASE_OF_  3                         ; Non-repeating key has been pressed and registered. Wait for it to be up. JSR  p?TERMINAL                 ; Just wait until no key at all is pressed. After p?TERMINAL, Z=1 means no keys. CMP  SHIFT_KEY              ; just released). Was it the shift key? JMP   ktk1                  ; starting over. JMP  ktk1                           ; variable (ie, store 0 in it) and start over. To give another example of the use for the states and target times, consider another task that activates STRING_EDIT_TASK which takes an entry from the keypad (with keys processed by KEY_TASK above) and exits when the user presses either <Enter> or <Esc>. What's left in NEW_KEY tells the other task whether the user wanted the entry accepted, or aborted and wanted to keep the default. A message saying either "Aborted" or "Entry accepted" (or other appropriate message) should show long enough to see it before changing the display. One second may be good; or, if they need time to write down a result, it should probably be left until they press another key. In either case, you don't want to use a delay loop, as the computer has other things it needs to do while waiting. Carrying the states further, adding to #2 above (about 10 paragraphs below the "Cyclic Executive" title), project B with its small, text-only LCD and keypad had a MENU_TASK which, after selecting a menu item, kept routing the execution to that item for further choices and so on until finished, so I had variables MENU_STATE, MENU_ITEM_STATE, and MENU_ITEM_STATE_L2 (the "L2" meaning "level 2"). The nested menu levels would usually exit quickly because they would run thousands of times waiting for the next key press. When the deepest level of menu item was carried out, or if the user exited the whole menu structure, it would clear the MENU_STATE variable so the top level would start over and watch for the user to press the "MENU" key before presenting the first item in the list of choices in that top-level menu. If a task gets really complex, this method of routing execution to the right part of the task every time it is called may get a bit hairy if you really wanted to avoid all unnecessary delays. Project B had an intelligent character LCD which takes a certain amount of time to do various things, the longest being clearing the screen which may take up to 5ms. (Most LCD functions take a maximum time of 40µs.) Especially since I used subroutines for the LCD functions, trying to give back control while waiting for things like that would be rather prohibitive, so I didn't do that, choosing to just wait instead, and it was not a problem in this case. (Fortunately clearing the LCD is not done often.) Otherwise, depending on the application, it may work to break the tasks down into sub-tasks (which is more or less what I did with the menu and menu items). The PAUSE function used in programs running under a cooperative multitasking OS is a nice way to handle some of this, but again, here we're dealing with a situation where we don't have a multitasking OS (and maybe don't even want one). Rather than having something external schedule the tasks and give each one a certain slice of time, the tasks themselves determine how much time to take, always keeping in mind the fact that processing power is not abundant, and in many cases they gave control right back almost immediately; ie, they were not selfish. It's not like a government or school budget where money budgeted for a particular account gets spent, even if wasted, this year, just to make sure it is not taken out of the budget next year! In project A, interrupts were firing at 24,000 per second. Since the task switches were only subroutine calls and returns, and there was no context-switching overhead to speak of, the interrupt timing jitter was little enough that it was not significant. Interrupts were not disabled for this. Project A's interrupts were primarily for timing A/D and D/A (actually PWM) conversions, and a couple of the tasks were doing software anti-aliasing since I was only recording and playing 6K samples per second, for voice-band communications. The ISR also ran a real-time clock, not for time of day, but for timing button de-bouncing, button-hold time (it had a different function if you hold it for a second or more), squelch-activation times, and other things. Having the one real-time clock works out fine if you work it like a room full of people all watching the same clock on the wall to time their individual tasks. None interfere with any of the others. The YouTube video "CPEU2 - How to program a multitask application without an operating system" has the right idea (bad audio notwithstanding); but the lecturer is incorrect in saying you need to make the ISR increment multiple counters! All tasks should watch the same real-time clock counter bytes, and add the desired offsets to get the target times to watch for, and keep those target times in their variables. When they're watching for the target time, they just take the current time on the clock and subtract the target time in the variable. If the answer is negative, you have not arrived at the target time yet. Now what if you need KEY_TASK or other tasks running to get through something in the setup, before starting into MAIN_LOOP? You can still set up loops invoking the needed tasks before reaching MAIN_LOOP; but a major difference will be that such loops will not be infinite; ie, you will drop through upon specified exit conditions. Hopefully that gives the idea. Parts of it initially drove me nuts, but gradually I found a way to make it all work and make it clear. These two projects were the first full projects I did with my structure macros, and they made a huge difference in making it clear and keeping control of the project. The execution-time distribution between tasks will not be equal (unless by some stroke of luck). It doesn't really matter though. Each task is given the same number of chances per second to run. In project A, carrying out the state machines, the entire cyclic executive loop was run thousands of times per second, in spite of the ISR taking 75% of the processor time. In project B, I observed the loop running at 12,000-16,000 times per second near the end of the development, again in spite of the ISR taking 75% of the processor time. This is far more than you would get with, say, a 10ms interrupt to change tasks with a preemptive system on a low-powered processor. Switching tasks every 10ms and having 8 tasks for example, each one would run only about 12 times per second, not thousands of times, let alone over 10,000 times. Tasks that have less to do at the moment simply take up less time. Again however, you can call a task more than once in the main loop, if its priority is high and you want to shorten the time it goes between runs. Note that even during the task switch, interrupts are accepted, without delays. Note also that any task can access the hardware resources, like ports, timers, etc..
Variables will generally be global, but other programs will not be using them except where the variables are specifically intended to pass info from one task to another. In a simple system like the 6502, you may have to be careful about what happens to variables if your top task adds or deletes other tasks. Since each task runs until it is at a good stopping point, more variables that it might need are freed up when it gives control back to the main loop, meaning they can be re-used by other tasks, and you won't need as many such variables. In this example two threads will be initiated which will use different stack areas. Using a round-robin scheduler running in an irq (context_switch) these threads are run one after the other. The thread data is stored on the stack, suitably for RTI, so you only need to manually push the register (A, X, Y) values. In the end it comes down to adjusting the stack pointer for each thread. The stack pointer of each thread is stored starting at thread_data. Code follows. It's relatively short and easy to understand. It's too simple to call it an OS, but it is preemptive. Also, there's an example of doing preemptive multitasking in the last 2/3 of this page on the Atari Wiki.